Today I have (what I hope) to be a fun, short guessing game. Here is how it will go: I will showcase two books-one I really like and one I really don't like. It's up to you to guess which is which. I thought it'd be a fun way to quickly mention a well-loved book as well it's opposite. 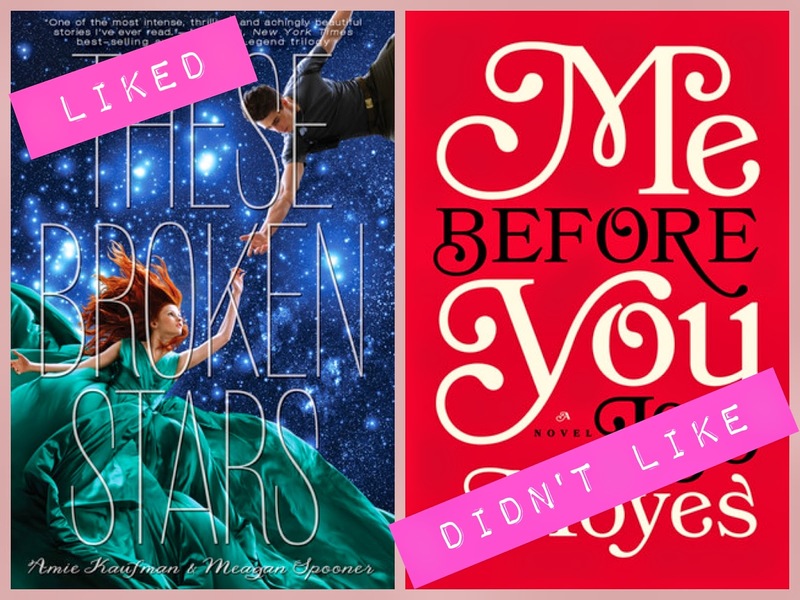 For today's books, I have Jojo Moyes' Me Before You and Annie Kaufman and Meagan Spooner's These Broken Stars. 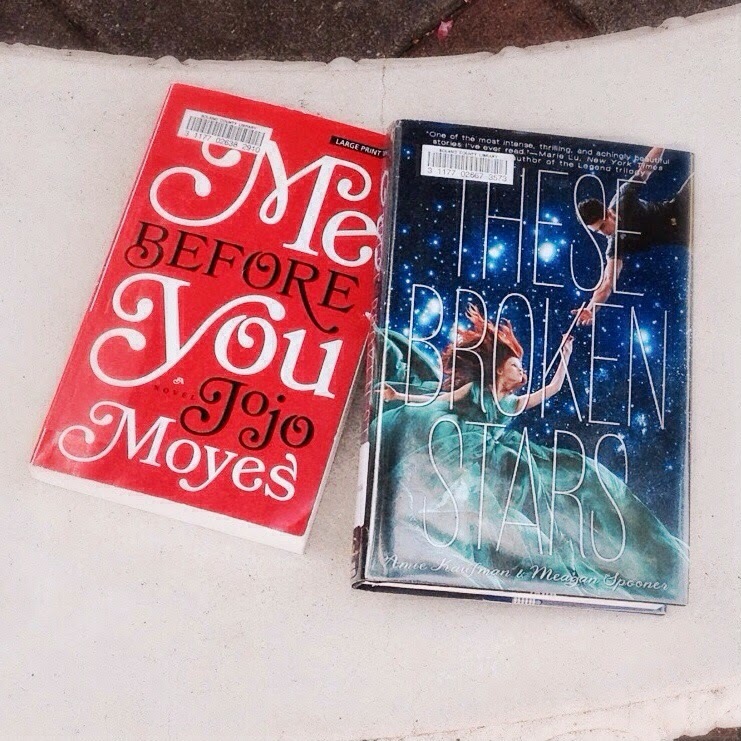 Me Before You (Moyes) is a contemporary adult novel of romance and life. These Broken Stars (Kaufman, Spooner) is a space novel of survival and romance. One of these I really enjoyed, and felt incredibly sad to have finished. The other, I felt myself wanting to gag nearly all the way through. Keep reading to find out (and feel free to put your guesses, whether correct or incorrect in the comments). Also, I like to keep everything SPOILER-FREE so everyone can enjoy! I had high hopes for Me Before You. It has an average rating of 4.33 stars out of 5. I very much enjoy contemporary novels with touches of romance. In theory, it had everything going for it. But I felt it was executed horribly. It was a book that was trying to approach serious topics but did so in cliched, cheesy, cringe-worthy ways that had me (mentally) gagging nearly all the way through. When I read the "climactic" chapter, I literally laughed out loud. The protagonist was irritating and I had to keep reminding myself that she wasn't a teenager but a woman in her mid-20s. I have more to say, but I'll save that for the upcoming review. As for These Broken Stars, I wasn't sure what to expect. I enjoy sci-fi/space/survival novels but the cover wasn't something I wouldn't typically pick up, so I was skeptical. The book ended up completely surprising me. It could've used more space, but overall it was simply refreshing and unique. When I finished it, I had some definite feelings of book hangover. I'm disappointed to hear the sequel won't be continuing from the ending of this book, but at the same time, good standalone novels are harder to find these days. I hope you enjoyed the first installment of my new book guessing game. It'd be ideal to make this a weekly post, but knowing me, I wouldn't hold your breath. Thanks for reading, and I'll be back in a couple days for my full review of Me Before You. I loved Me Before You but I've never heard of the other book, will add it to my to-read book! :) I hope you like it!